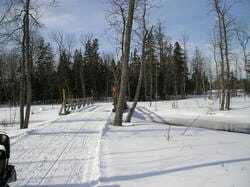 The Drummond Island Snowmobile Club is a family oriented, fun loving group that enjoys riding the trails on Drummond Island and in the surrounding area. Safari rides are enjoyed by members throughout the snowmobiling season. Riders are taken at a pace that makes it possible for all age groups to participate. Stops are made along the way to take in the scenery and enjoy conversation with other club members/riders. Family membership includes children from the age of 12 years through the age of 17. Accompanying the application for a family membership shall be a copy of the child's snowmobile safety certificate in accordance with DNR regulations that a person 12 years old but less than 18 years old: may operate a snowmobile without supervision of a person 21 years of age or older; may operate a snowmobile without supervision if they have in their immediate possession a valid snowmobile safety certificate; may cross a highway or street without supervision if they have in their immediate possession a valid snowmobile certificate.